Is your school, church, or other community organization looking for ways to fund a new playground, splash pad, or play area? In a previous article, “Writing a Winning Grant Proposal”, we discussed the components of a playground grant application and offered a few pointers on how to make your proposal stand. 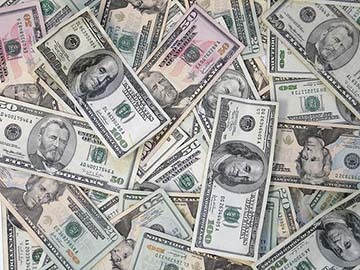 Today, we will look at some specific resources to help you find funding for your project. We will also explain why funding agencies want to see that safety and value are built into your proposal. Showing you have a long-term plan to pay for the maintenance of your playground and to protect children from the risk of falls and other injuries increases the likelihood of you receiving money from funding groups. Whether you are building a new play area or seeking funding to renovate an old one, we hope these tips are helpful. You can also check out our article about renovating playgrounds on a tight budget. Every year, churches, schools, and other youth activity organizations get billions in funding for community play and recreation projects. At your local library and online, you will find hundreds of local, regional, national, and international funding sources that underwrite the costs to build and maintain playgrounds, fitness parks, and other recreation initiatives. Some of these grants are not advertised, so you may need to find a company or a group whose values and goals align with yours and ask them directly. Get ready to use the phone and knock on some doors! Big corporations like the NFL, CVS, and General Mills all have grant opportunities that are worth researching. But the drawback with these high-profile companies is that you will to be one of dozens (if not hundreds) of applicants. For this reason, you should also look for fundraising opportunities a little closer to home. For example, small businesses in your community and regional industries often have philanthropic and community development programs for children. Your county, municipality, or state government may also have programs and grants. In some cases, this funding can be used for playgrounds. Again, you may have to get on the phone and do some digging; while these agencies probably have a website, they do not always make it clear if funding is available. Do not forget civic and service clubs like Kiwanis, the Lions Club, the Junior League, and the Rotary Club. Many of these local groups also have national foundations that may have funding available for large-scale, community projects. These service organizations include many community leaders in business, education, and government; engaging with their members can give you valuable networking opportunities when seeking fundraising support. Here are a few 2018 grant opportunities that may match your needs. Click through the links below to read the requirements. The Afterschool Alliance is dedicated to raising awareness of the importance of afterschool programs. Their website has a funding section that includes updates on available grants, as well as tips on seeking funding for afterschool programs, guides on how to build sustainability, a database on funding sources, and information on the most common sources for finding funding to support programs. The Tony Hawk Foundation is accepting applications to build public skate parks in low-income areas. Grants from $1,000 to $25,000 are available. Application deadline is June 11. The 2018 Outdoor Recreation Legacy Partnership Program is offering grants to help create and improve state and locally-owned park and outdoor recreation areas. Applications can be submitted through September 14. The Target youth soccer grants program provides support for schools, government agencies and nonprofits. Money can be used to cover player registration fees, equipment, and training for volunteer coaches. Application deadline is June 30. Grants4Teachers has a free grant database where you can search for current available grants for your school or organization. The database is updated continuously, so be sure to check back often for new opportunities. The Grants.gov website provides a common website for federal agencies to post discretionary funding opportunities and for grantees to find and apply for them. There you will find information on over 1,000 grant programs, along with lots of helpful information about creating a successful application. Granting agencies want to see that you put thought and effort into planning your play area. This includes a plan for long-term safety and cost-effective surfacing options that require less maintenance and decrease the risk of injury from falls for years to come. Remember: If an organization is going to help you pay for your project, they will want to make sure it is a well-planned undertaking with a long-term plan to keep kids safe. When you are putting together your grant application, make sure you emphasize how you will minimize the risk of injury from falls. Safety surfacing is a piece of the project that is often overlooked. Poured-in-place safety surfaces from No Fault offer impact attenuation from falls. In plain English, they offer cushioning when a child falls down decreasing the risk of injury. You may be tempted to use gravel or wood chips in your play area to keep the up-front costs low, but there are long-term costs associated with maintenance and replacement of wood chips and pea gravel to consider. 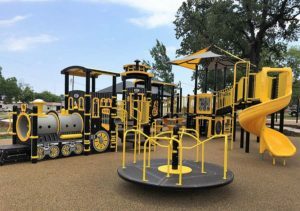 Additionally, these materials cannot match the safety features of recycled rubber surfacing, and they are not engineered to work with all the play equipment commonly found in modern play areas. Got Questions? Call No Fault! We hope our series of articles on playground funding has given you some ideas. It is not an easy process, but if you are organized, diligent, and persistent, you can find the appropriate funding for your project and experience the satisfaction of making your plan a reality. Make a pot of coffee; get ready to make lots of phone calls; and read the “fine print” on a lot of funder websites. Rest assured–when you see the kids enjoying the playground of their dreams, you will know that all your research and hard work paid off! Finally, if you need assistance selecting the right playground safety surfacing for your play space, No Fault representatives can help! 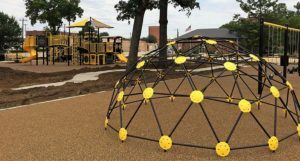 No Fault provides playground surfacing nationwide, including poured-in place rubber surfacing, bonded and loose-fill rubber mulch, rubber tiles, and synthetic turf. Wherever your group is in the planning process, you can reach out to No Fault today for help!